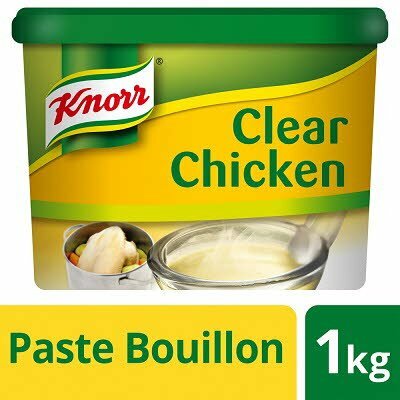 A Chicken Flavour Paste Bouillon. Modified Potato Starch, Salt, Vegetable Oil (Palm), Yeast Extract, Chicken Extract (6.4%), Sugar, Flavourings, Onion Powder (1.2%), Carrot Juice Powder, Sage. Pour 1 litre of boiling water onto a dessert spoon (25g) of Bouillon Paste. Stir until dissolved. Keep tub tightly closed in a cool dry place 15-20 Degrees Celsius.